Explore Louisville scenery in the most unique and intimate way possible! This private hot air balloon ride takes you anywhere from 300 to 800 feet above ground! Explore Louisville scenery in the most unique and intimate way possible! This private hot air balloon ride takes you anywhere from 300 to 800 feet above ground (on special occasions, when your pilot’s chasing the wind, you might even ascend 2,000 feet!). With only the wind determining your route, this sky-bound adventure is fully privatized, which means you and that special someone can take it all in without distractions. Fly either sunrise or sunset: both trips offer unique takes on the landscape and are equally magical. Enjoy an hour-long hot air balloon ride above Louisville! Watch the giant balloon inflate at the launch site. Want to impress your sweetheart? Lend a hand with the inflation process! Explore Louisville’s green acres as you drift hundreds of feet above the horizon. 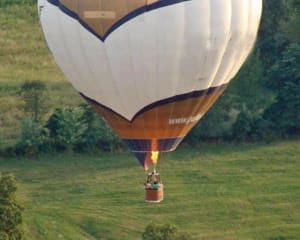 Receive private access to the balloon for the most romantic tour imaginable. Your pilot’s a ballooning veteran so even though the flight path is determined by Mother Nature, he’ll point out all the right sights and landmarks to keep you wide-eyed. Planning a birthday or anniversary? Thinking about popping the question? Whatever the special occasion, this Louisville hot air balloon tour earns you big points with your better half! Great trip!! Don and Tom were great!